Synthesis and structural properties characterization of Ap/MgO nanocomposites for biomedical applications. Citation: Vijayalakshmi V, Dhanasekaran P. Synthesis and structural properties characterization of Ap/MgO nanocomposites for biomedical applications. Biol Med Case Rep. 2017;1(1):1-6. In this study, a novel method was used to produce a nanostructured composite consisting of hydroxyapatite and MgO by varying the temperature. The structure and morphology of the synthesized nanocomposite were characterized. From x-ray diffraction (XRD) analysis, an increase in crystallite size and degree of crystallinity with an increase in the temperature was observed. The XRD investigation confirms that the grain size of the synthesized nanocomposites is in the range 4-11 nm. The grain size increases when the temperature is increased due to the agglomeration of nanoparticles. The fourier transform infrared spectroscopy (FTIR) studies confirm the presence of PO4 3-, CO3 2- and Mg2+ and oh- groups. The UV-VIS spectroscopy measurements show the reduction in the band-gap upon the temperature. Transmission electron microscope (TEM) images ascertained that nano HAp/MgO at 250°C and 300°C composite shows flakes like morphology. Nanocomposites, Hydroxyapatite, MgO, TEM, X-ray diffraction. Among all calcium phosphate bioceramics, hydroxyapatite (HAP), Ca10(PO4)6(OH)2, is the most extensively used biocompatible ceramic materials for bone tissue engineering, as its chemical composition is similar to the bone mineral phase. Biological apatites are non-stoichiometric nanocrystal- line carbonated Has (CHA). Therefore, synthetic HAP ceramics are doped with small amounts of additives (e.g., Mg2O, Zn2O, Mn2O ions). Although the substitution does not intensely change the crystallographic properties of HAP, it affects the biological and mechanical properties [1-4]. An ionocovalent structural model of the apatite family shows a structure that can accept both cationic and anionic substituents. These substitutions induce modifications in lattice parameters and crystallinity, which substantially influence the solubility of HAP at physiological conditions without generating significant changes in the hexagonal system of apatite. One of the elements associated with biological apatite is magnesium. Mg incorporation into HAP stimulates osteoblast proliferation. Mg acts similar to a growth factor during the early stages of osteogenesis and promotes bone formation. Typical concentrations of carbonate and Mg ions in human bone are 5.8 and 0.55wt%, respectively. Although the extent of these elemental substitutions is minimal, they are important for biological activity and interaction between bone mineral and calcium–phosphate-based implant materials by influencing crystal growth, dissolution rate, solubility, surface chemistry and charge, morphology, and the mechanical properties. By substitution of a smaller Mg ion for a larger Ca ion, additional structural changes may be required to prevent destabilization/decomposition of the structure during heat treatment process. This can be achieved by co-substitution of a second ion, to the HAP structure [5-7]. Thus, MgO nanoparticles dispersed within polymer composites have the potential to enhance bone tissue formation with limited adverse degradation reactions. Taking advantage of these prior studies, the objective of the present in vitro study was to characterize MgO nanoparticles as additive materials for orthopedic tissue engineering applications, especially when used in combination with HAP nanoparticles. HAP/MgO nanocomposite was prepared using a novel environmentally benign technology called a hydrothermal method. The following precursors were used for the preparation of nanocomposite. Calcium Nitrate (Ca (NO3)2.4H2O, Merck Gd, 99%) is taken as the Calcium precursor. Diammonium Hydrogen Phosphate (NH4HPO4, Merck Gd, 99%) is taken as the Phosphate precursor. Magnesium Nitrate hexahydrate (Mg (NO3).9H2O, Merc Gd, 99%) is taken as the Magnesium precursor. NaOH (Merck, purity 99%) is taken as the pH reagent. Double distilled water is used to obtain a homogeneous solution. The 0.1 M of Mg(OH)2 was prepared by adding 6.41 g of Magnesium Nitrate dissolved in 100ml de-ionized water. Then the 0.8 g of NaOH solution was prepared in 50 ml de-ionized water. The NaOH solution added to increase the pH value to 11. Thereafter the prepared solution was allowed for overnight stirring and kept undisturbed for aging. In order to synthesize nano-hydroxyapatite 5.9 g of Calcium Nitrate and 1.98 g of Diammonium Hydrogen Phosphate were taken in the hydrothermal vessel and mixed with de-ionized water with the molar ratio of 1:0.6 to maintain the Ca/P ratio 1.67 which is the stoichiometric ratio of HA. The pH of the above solution is increased to 9 by adding 0.2 M of NaOH solution in 50 ml. The prepared Mg(OH)2 solution was added drop by drop to the above solution. The vessel is placed in the oven of a hydrothermal instrument. The mixed solution was hydrothermally treated at 250°C for 5 hours. After 5 hours the autoclave is cooled to room temperature. Hydroxyapatite-MgO nanocomposite is separated by filtration, washed a few times and kept in hot air oven at 60°C. The dried composite is grind using mortor and pestle. Similarly, the remaining sample was prepared at 300°C. The X-ray diffraction (XRD) patterns of the powdered nanoparticles were recorded using XRD-1008 with Cu- Kα radiation (1.54060?). XRD pattern for HAP/MgO Nanocomposite synthesised at 250°C and 300°C shows clear reflections from the (1; 1; 2), (0; 0; 2) (2; 1; 1) and (3; 1; 0) planes in the range 25°C to 50°C. The prepared samples show well-defined peaks which indicate high crystalline nature. All the diffraction peaks could be readily indexed with pure hexagonal phase (space group: P63/m (176)) with lattice parameters of a=b=9.460? and c=6.880? which are in accordance with the JCPDS file card number #821943. The average crystallite size of the sample synthesized at 250°C and 300°C as calculated by Scherrer’s formula (D=kλ/βcosθ) was 12.30 nm and 15.309 nm respectively. The value of lattice constants obtained are a=b=10.405?, c=6.4388? and a=b=10.2499?, c=6.3805?. The unit cell volume (V) inferred are 1804.7671?3 and 1735.5056?3. 0.0085, 0.0150 are the degree of crystallinity (Xc (%)). The (0; 0; 2) peak was chosen to calculate the average crystallite size, lattice parameters, unit cell volume and degree of crystallinity for HAP. It is known that the preferential growth of apatite crystal is along the c-axis [8,9]. The volume (V) of the hexagonal unit cell and the degree of crystallinity (Xc) of the MgO/HAP nanocomposites are obtained using the equation, respectively, V = 2.589 a2c and (Figures 1a and 1b). Figure 1a: XRD pattern of HAP/MgO nanocomposites at 250°C. Figure 1b: XRD pattern of HAp/MgO nanocomposites at 300°C. Where, β is the full-width at half maximum, Xc the degree of crystallinity, KA the constant (0.24) and a and c are lattice parameters . 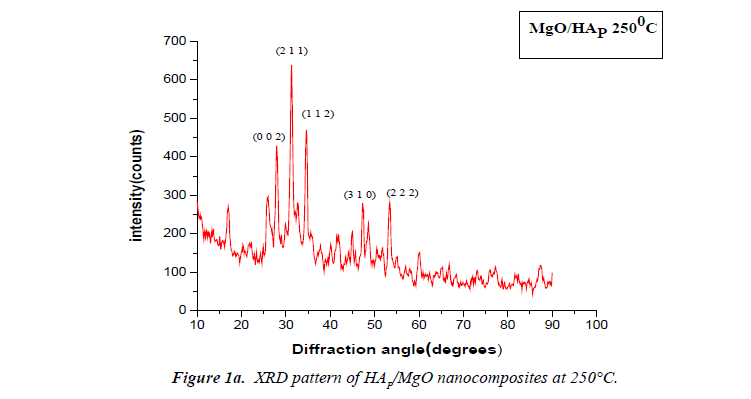 The characteristic peaks of nano HAP/MgO composite were examined by Fourier Transform Infrared Spectroscopy (FTIR). The pellet for FTIR measurements was prepared by mixing the sample (2 mg) with 200 mg of IR grade KBr. The mixed powder was pressed in a stainless steel pellet dye for one minute at constant pressure to obtain a translucent disc. The absorption spectra were measured at 4000-400 cm-1 using SHIMADZU spectrometer, Japan. Biological HAP is usually Calcium deficient; it is always substituted with a carbonate (Figures 2a and 2b). 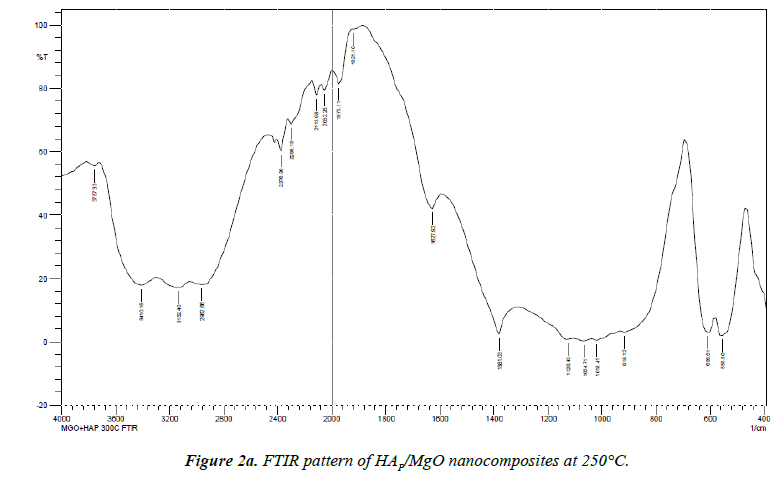 Figure 2a: FTIR pattern of HAP/MgO nanocomposites at 250°C. Figure 2b: FTIR pattern of HAp/MgO nanocomposites at 300°C. The most characteristic peaks in the FTIR spectra of synthesized HAp/MgO nanocomposites at 250°C and 300°C are PO43-, OH-, CO32- and Mg2+. CO32- forms a strong peak at 1381.03 cm-1 , 1396.43 cm-1. The broad peaks appeared at 1018.41 cm-1 and 1080.14 cm-1 indicate the presence of the asymmetric stretching (ν3) mode of vibrations because of the phosphate bonds [8,9]. Weak peaks in the range 550-620 cm-1 are observed due to the presence of Mg2+ ions. The broad peak spread over the range between 2957-3450 cm-1 and 1627.92 cm-1 reveals the superposition of absorption because of the stretching mode of surface hydroxyl groups and adsorbed water molecules . OH- group forms strong and broad peaks in the range 2900-3410 cm-1 shown in (Table 1). Table 1: FTIR spectrum analysis. The UV–visible absorption spectra of the samples were recorded in the wavelength range of 200 nm to 800 nm using a Shimadzu UV 1700 UV spectrometer. The band gap energy was calculated by using Einstein formula (E=hc/λ). Where h is a Planck’s constant (6.626 × 10-34J), c is the velocity of light (3 × 108 m/s) and λ be the wavelength of the sample recorded. UV–visible spectroscopy was used to characterize the optical absorption properties of HAp/MgO nanocomposite at 250°C and 300°C. We obtained the band gap to be 5.97eV for MgO/ HAP at 300°C and it starts decreasing for MgO/HAP at 250°C as 5.689eV respectively. The decrease in Eg for decreasing the temperature (Figures 3a and 3b). Figure 3a: UV-VIS spectrum of HAp/MgO nanocomposites at 300°C. 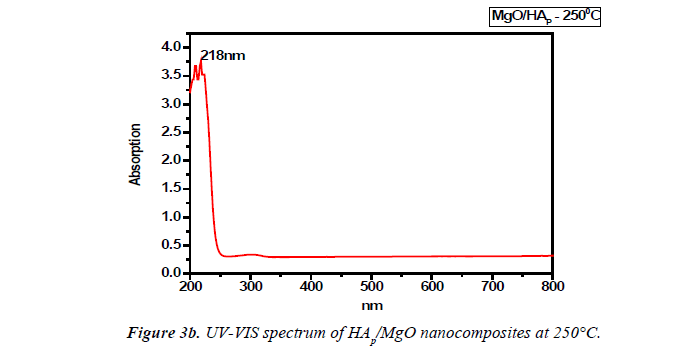 Figure 3b: UV-VIS spectrum of HAp/MgO nanocomposites at 250°C. Transmission Electron Microscope (TEM) is an equipment to let the incident electron beam to transmit a thin specimen at high acceleration voltage, 80-3,000 kV, which results in generating signals caused by the interaction between the specimen and incident electrons. Structures, compositions and chemical bonding of the specimen can be determined from these signals. 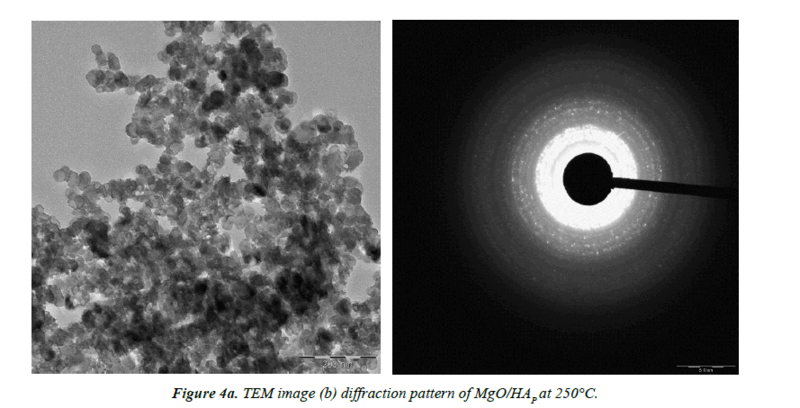 The particle size and morphology of the synthesized nano HAP/MgO composites with different temperature have been examined by TEM. Figures 4a and 4b reveals the TEM images of HAP/MgO nanocomposite at 250°C and 300°C respectively. The sample exhibits relatively flakes like morphology [11,12]. Figure 4a: TEM image (b) diffraction pattern of MgO/HAP at 250°C. Figure 4b: TEM image (d) diffraction pattern of MgO/HAP at 300°C. In this study, nano HAP/MgO composites were successfully prepared at 250°C and 300°C using the hydrothermal method. The crystallite size, crystallinity, functional groups and morphology, were studied using XRD, FTIR, UV-visible absorption measurement, and TEM analysis. The XRD investigation confirms that the grain size of the synthesized nanocomposite is in the range 4-11 nm. The value of lattice constants obtained are a=b=10.405?, c=6.4388? and a=b=10.2499?, c=6.3805?. The unit cell volume (V) inferred are 1804.7671?3 and 1735.5056?3. 0.0085, 0.0150 are the degree of crystallinity (Xc (%). The hexagonal phase with space group P63/m (176) has been confirmed from XRD results. The grain size increases when the temperature is increased due to the agglomeration of nanoparticles. The FTIR studies confirm the presence of PO43-, CO32- and Mg2+, and OH- groups. The UVVIS measurements show the reduction in the band-gap upon the temperature. We obtained the band gap to be 5.97eV for MgO/ HAP at 300°C and it starts decreasing for MgO/HAP at 250°C as 5.689eV respectively. 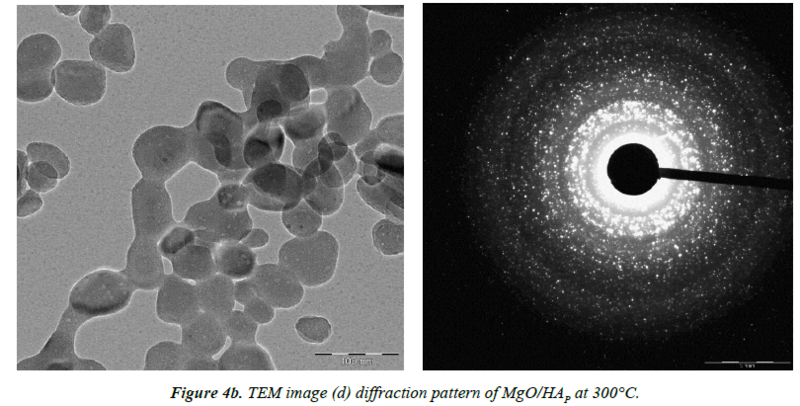 TEM images ascertained that nano HAP/MgO at 250°C and 300°C composite shows flakes like morphology. This study provides a platform for further research on the HAP/MgO nanocomposites for biomedical applications. Kirkland NT, Birbilis N, Walker J. In-vitro dissolution of magnesium–calcium binary alloys: Clarify in the unique role of calcium additions in bioresorbable magnesium implant alloys. J Bio Med Mater Res Part B: Appl Biomater. 2010;95:91-100. Klein CPAT, Blieck-Hogemrst JMAD, Wolket JGC, et al. Studies of the solubility of different calcium phosphate ceramic particles in vitro. Biomaterials. 1990;11:509-12. Dorozhkin SV, Epple M, Angew P. Biological and medical significance of calcium phosphates. Chem Int. 2002;41:3130-46. Legeros RZ. Calcium phosphate materials in restorative dentistry: A review. Adv Dent Res. 1988;2:164. Yang S, Min Q, Yao C, et al. MAO-DCPD composite coating on Mg alloy for degradable implant applications. Mater Lett. 2011;65:2201-2204. Liu DM, Troczynski T, Tseng WJ, Water-based sol-gel synthesis of hydroxyapatite: Process development. Biomaterials. 2001;22:1721. Rhee SH, Mater J. Self-assembly phenomenon of hydroxyapatite nanocrystals on chondroitin sulfate. Sci Mater Med. 2002;13:597-600. Rajkumar M, Meenakshisundaram N, Rajendran V. Development of nanocomposites based on hydroxyapatite/sodium alginate: Synthesis and characterization. Materials Characterization. 2011;62:469–479. Haque S, Rehman I, Darr JA. Synthesis and characterization of grafted nano-hydroxyapatites using functionalized surface agents. Langmuir 2007;23:6671-76. Hu R, Lin CJ, Shi HY. A novel ordered nano-hydroxyapatite coating electrochemically deposited on titanium substrate. J Biomed Mater Res Part A. 2007;80:687-92. Rajkumar V, Meenakshisundaram N, Rajendran V. In-situ preparation of hydroxyapatite nano rod embedded poly (vinyl alcohol) composite and its characterization. J Eng Sci Technol. 2010;2:2437–2444. Rajkumar M, Kavitha K, Prabhu M, et al. Nanohydroxyapatite-chitosan-gelatin polyelectrolyte complex with enhanced mechanical and bioactivity. Materials Science and Engineering C. 2013;1;33:3237-44.